Every new home for sale with The Park Lane Group features our market-leading extras package. 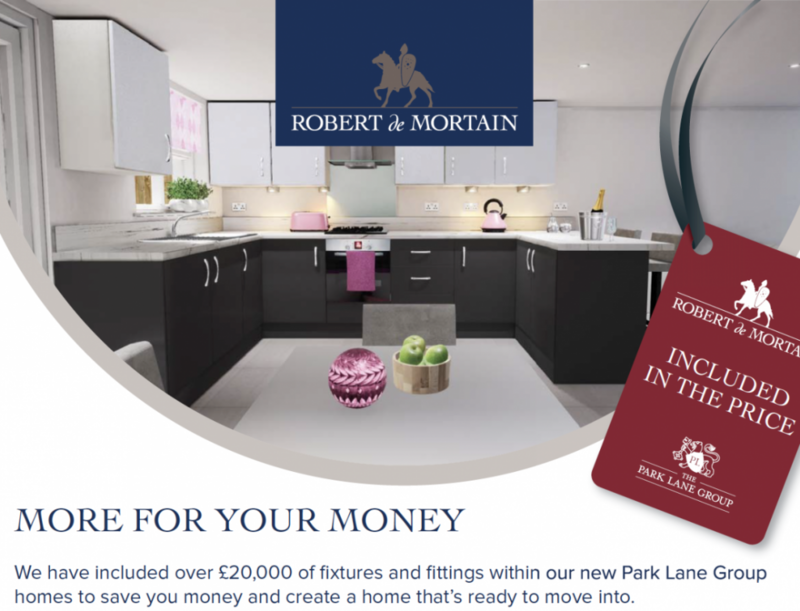 In our upcoming Robert de Mortain homes it adds up to over £20,000 of fixtures and fittings within each home! With most housebuilders you buy an empty shell which demands time and extra money to specify fittings before you can move in. Here at The Park Lane Group we include a comprehensive package in the price. From designer kitchens and integrated appliances to porcelain tiled flooring, lighting, upgraded bathroom fittings, close-boarded fencing, patios, and more, it makes for a home that’s ready to make your own. And it represents huge money savings for our buyers. You can find out full details within our latest More for Your Money brochure here. We believe it’s an inspired idea and one that’s unique to The Park Lane Group. To find out more about our new homes get in touch with our friendly sales team today. I would highly recommend The Park Lane Group for quick and efficient service - thank you.